SOEC's many activities and events are powered by parent volunteers, and there are many ways to share your talents with our school. We need and depend on your participation. Whether you are able to chair a committee or just lend a hand for an hour here and there, our volunteers are a valued asset of our community! To make parents aware of volunteer opportunities, we are now posting all upcoming volunteer needs for all of the events, fundraisers and activities at our amazing school. Check them out and sign up today! 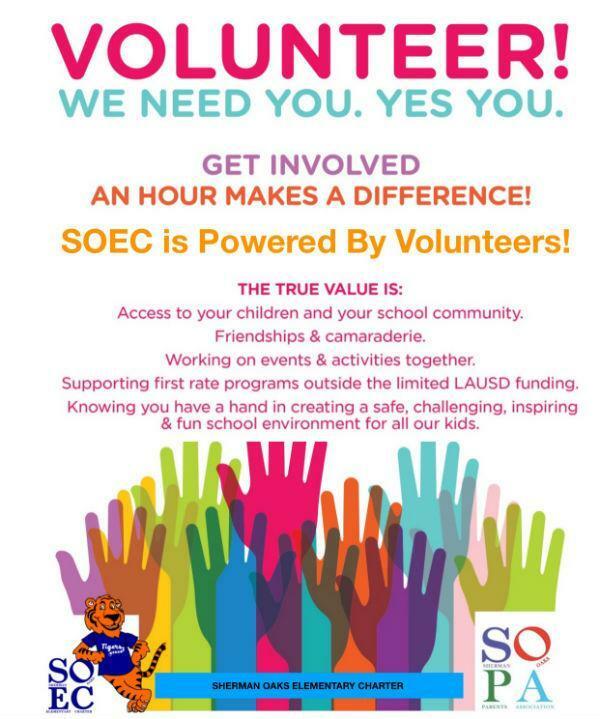 Volunteering at SOEC, is one of the most rewarding experiences you could have. The opportunity to make a difference in young people’s lives, as well as the chance to spend more time with your own child, is not worth passing up. But what if you don’t know what you want to do? –Volunteer in your child’s classroom. Talk with your child’s teacher to see how and when you can best help out in the classroom. Some teachers prefer volunteers in the classroom; while others prefer volunteers that can work on projects at home. Volunteers make the student-to-adult ratio in the classroom even lower. Another adult in the classroom can be beneficial, when the kids split up into small groups. This is especially important in the lower grades such as Kindergarten and First. Tasks may be as simple as helping cut and staple materials. New Policies for Volunteers: LAUSD has mandated new procedures for school volunteers to improve security and ensure the safety of students and school personnel. See below for important details on the new procedures and requirements. –The Governance Council. The Governance Council is informative, rewarding, and vital to our school’s future. There are a few ways you can become involved. Attend the monthly meetings which are open to the public. Be part of one of the Council committees. At our next election, put your name up for election to become a parent representative. And, as is the case for everything at SOEC, please voice your opinion – seek out Council representatives when you have an idea or concern. For more information visit our School Governance page. -SOPA and SOPA events. Participate in Sherman Oaks Parents Association (SOPA). To learn more about SOPA please read about this vital part of our community here- SOPA. SOPA has many programs and events that are conducted solely by volunteers. If there is a particular program or event at school that interests you, the person in charge would certainly love some help. There are plenty of opportunities to get involved, no matter how much or how little time you can give. To see a list of SOPA events that need volunteer help please go to the Events page in this section. To contact event chairs, go to the Committee & Event Chairs page. If you cannot find the event or contact you are interested in, contact any board member, and we will be happy to point you in the right direction. No matter what your interests or expertise, your presence alone will provide a great help as well as show your kids how much you care. So please take a moment and contact someone from the school, whether it be a teacher, an administrator, a member of the Governance Council or a SOPA board member, and we will do whatever we can to assist you in making a difference in your child’s educational experience.